San Miguel de Allende is a double winner at this year’s edition of Travel + Leisure, the largest travel magazine brand in the United States, at the annual World Best Awards as the #1 Best City in the World and the #1 Best City in Mexico, Central and South America. This award was defined by the Travel + Leisure readers. 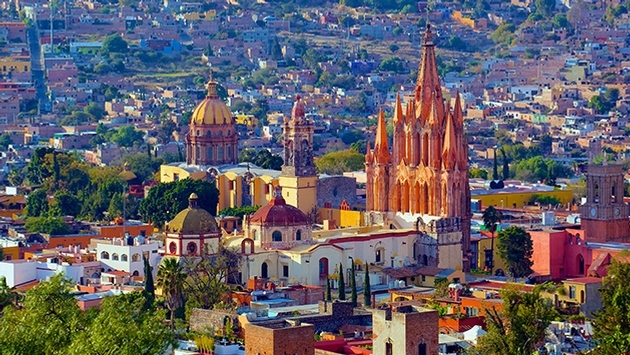 San Miguel de Allende outperformed other destinations in categories like: Sights, Landmarks, Art, Culture, Gastronomy, Friendliness, Shopping, Wellness, Wine Tourism and Wedding, and more. Located in the Bajio region of Mexico’s Guanajuato State, San Miguel de Allende is home for locals and more than 16,000 foreign people from more than 60 different countries around the world. This city is recognized by its boutique hotels, fine dining restaurants, certificated Spa’s and mostly for its architectural contribution of Mexican Baroque art, architecture movement, historical role and its inclusion in UNESCO’s World Heritage list at the “Protective town of San Miguel el Grande and the Sanctuary of Jesus Nazareno at Atotonilco in 2008”. Some of the most recognized hotels at the destination are: Rosewood San Miguel de Allende, Hotel Matilda, Mansión San Miguel, Casa Rosada and View Hotel Boutique, besides others. At this city, you can taste delicious and traditional food cooked by the most recognized Mexican chefs as: Jonathan Alvarado, Marco Cruz and Alonso Domínguez. They are considered as the Mexican ambassadors of artisanal Mexican food. The city of San Miguel de Allende will host the upcoming “Dress to Give: Fashion Days San Miguel de Allende” this November 8th, 9th and 10th, an extraordinary fashion event that will merge first class catwalks with famous designer clothes and the extraordinary traditional architecture from the city. Enjoy one of the top fashion events in México. Attend to Fashion Days and visit San Miguel de Allende, the World’s Best City. SOURCE: Guanajuato Tourism press release.